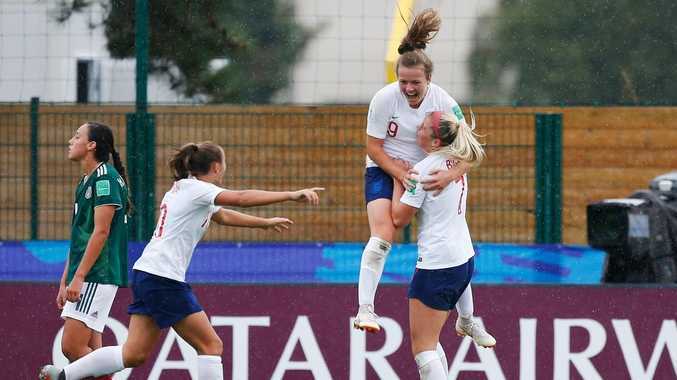 ENGLAND is enjoying another exciting World Cup run - this time in the women's under-20s - charging into the quarterfinals with a 6-1 thumping of Mexico in France. Lauren Hemp was the star scoring three goals, but it was the strike that secured her hat-trick in the 80th minute that won't quickly be forgotten. Hemp muscled her way around her opponent to create a one-on-one with the goalkeeper. After a big collision, she came crashing down on top of the ball and scored in bizarre fashion. The result saw England finish top of Group B and progress to a final eight clash against the Netherlands. Australia did not qualify for the tournament after losing a third place playoff against China in the under-19 AFC women's championship last year.